One of the things I relied on Microsoft Outlook for prior to embarking on the 30 Days With...Google Docs adventure was to sync my contacts and calendar events to my iPhone. Today we'll walk through how I set my iPhone up to sync with my information out in the Google-verse. Keeping contact and calendar data synced with my iPhone is crucial. As I roam about, the iPhone is my lifeline to the world, and it needs to have current, accurate, contact and calendar information in order to be of any value. Before this month my iPhone (and iPad for that matter) would simply sync all contact and calendar information from Microsoft Outlook every time I connect it to the USB port on my PC. Now, when I connect iTunes still syncs my music, photos, and apps, but the Microsoft Outlook data is gone. Thankfully, Google figured out a way to leverage the Exchange Actice Sync capabilities of iOS to sync email, contacts, and calendar information from your Google account. Best of all, it syncs wirelessly on the fly so I am not dependent on tethering my iPhone to my PC to make sure I have the most current information. Go into Settings -- Mail, Contacts, Calendars -- and tap Add Account.... Next, tap Microsoft Exchange at the top of the list of account types. If you want, you can change the Description field to be "Google" or something more accurate than "Exchange". Enter your full Gmail email address in both the email and username fields, add you Gmail account password, and tap Next at the upper right. If you get a message that the certificate can't be verified, just tap Cancel, then enter m.google.com in the Server field. Tap Next again, and voila! You have to turn on the Contacts and Calendar syncing, which brings up warnings to let you know that syncing Contacts or Calendar with Google will erase and replace any data already on the iPhone. At the bottom of the account settings, you can also define how many days worth of email should by synced, and which folders from your Gmail account should be included. All in all, this is a better solution than syncing locally with Outlook. 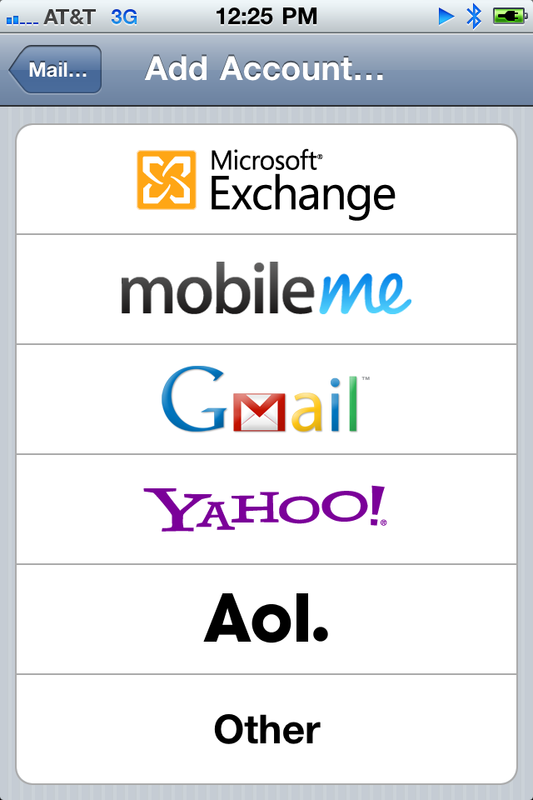 I can change information in Google or on my iPhone and that data will be synced automatically without me having to connect to my PC, and I have access to more email than just the most recent 200.